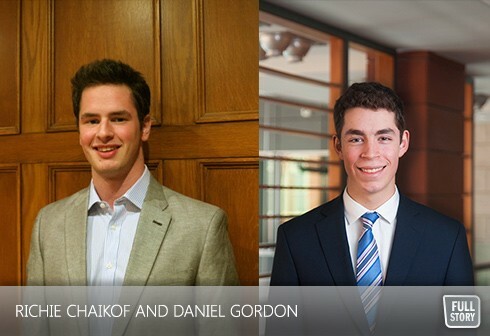 By Daniel Horowitz--Two Torontonians have been selected as the first Canadian students to take part in Birthright Israel Excel, an innovative program for students who combine academic achievement with social responsibility, the desire to succeed in the world of business and, as is the cornerstone of all Birthright Israel initiatives - strengthen their connection to Judaism and the State of Israel. The Taglit-Birthright Israel program, supported by the Charles & Lynn Schusterman Foundation, the Steinhardt Family Foundation and the Paul E. Singer Foundation, will bring 40 accomplished Jewish students to Tel Aviv at the end of May where they will intern for 10 weeks with some of Israel’s most exciting companies, gaining invaluable experience and making vital contacts that will help them in their future careers. Birthright Israel Excel participants will also meet with a myriad of Israel’s political, business, technology and philanthropic leaders. The two pioneering Torontonians – chosen out of more than 100 Canadian applicants - are Richie Chaikof, a 21-year-old graduate of CHAT’s Wallenberg Campus, currently in his third year at Western University and his first year at the Ivey Business School, and 19-year-old Daniel Gordon who recently completed his second year at Queen’s University in the Commerce program. The pair, who will be heading to Israel on May 31st, will be joining 38 other participants selected from across the United States. Chaikof, who for now wants to give investment banking a shot, will spend his ten-week internship with a major bank in Tel Aviv. As for Gordon, May 31st simply can’t come fast enough. A graduate of TanenbaumCHAT in Vaughan, Gordon, a participant on the 2011 March of the Living, is not only excited about gaining invaluable business experience and contacts, but doing it in Israel. And, as someone who continues to advocate for the Jewish state, Gordon feels the time in Israel will better prepare him to continue to advocate, but through a different slant. Excel is an extension of Taglit-Birthright Israel, which sends Jewish adults between the ages of 18 and 26 on a 10-day trip to Israel to strengthen each participant’s Jewish identity. Taglit-Birthright Israel aims to build an understanding, friendship, and lasting bond with the land and people of Israel and to reinforce the solidarity of the Jewish people worldwide. Taglit-Birthright Israel is funded through a historical partnership between of the people of Israel through their Government, private philanthropists (Birthright Israel Foundation of Canada) and local Jewish communities around the world (in Toronto, through UJA Federation). “We are thrilled and proud that Richie and Daniel were given the opportunity to join this elite program,” said Elizabeth Sokolsky, VP of Education and Operations for Taglit Birthright Israel, North America. “We hope that we will be able to secure the necessary funding in Canada to expand the number of Canadian participants in the future”.